Due to a change in industry regulation, Porkbun now offers a broader range of options for hiding your domains' contact information from public view. Previously, your only options were to turn our WHOIS Privacy service on or off for a given domain. 1. 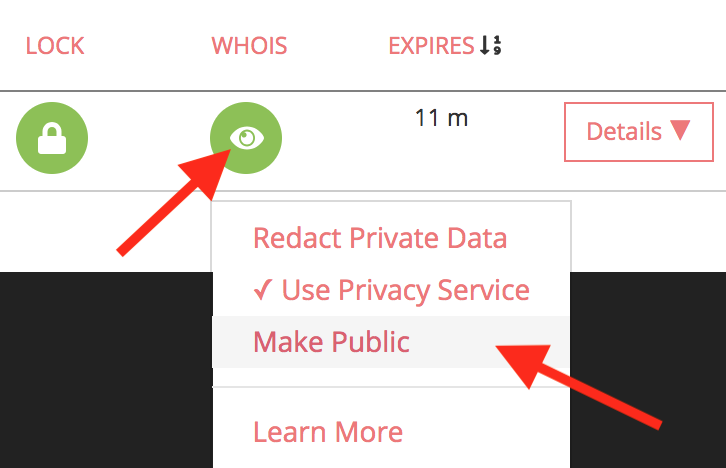 When a domain is Redacted, we'll send the domain's registry (for instance .design) your personal data; whereas when WHOIS Privacy is turned on, we won't send that personal data unless the registry requires it. To summarize, you probably want to use WHOIS Privacy to protect your contact info. Redaction is often the best option for those who wish to publicly assert ownership of their domain and any intellectual property represented in the domain name itself while protecting their personal information from spammers and fraudsters. Why is my domain redacted now? I want my contact info public. Click the yellow or green icon in the WHOIS column and select "Make Public." Please note that even if you select "Make Public" your personal data will probably only be published in Porkbun's WHOIS database. Most registries are now refusing to publish any private information for any domain in their WHOIS database, so it won't show up in ICANN's WHOIS search tool, for instance. Sorry, we know it's weird. Basically, on the week of May 21, 2018, WHOIS started being split in two due to a regulatory change. Now, different information will now usually appear in Registrar WHOIS ( https://porkbun.com/whois) and Registry WHOIS (https://whois.icann.org/en). Specifically, even if you decline WHOIS privacy or redaction, most registries still won't publish your contact info. As before, your best bet if you want to be easily contacted by the public is to publish a contactable email address on your website.